Happy Mardi Gras (“Fat Tuesday”)! After all of the stuff that has been coming out of my kitchen in the past couple of weeks (Churro Wontons with Salted Butter Caramel Dipping Sauce, Pavlova with Nutella Mousse, and Super Bowl Chocolate Crunchie Munchies, just to name a few), I have ZERO need for more fattening and sugary treats. So instead of a fattening Fat Tuesday, we’re aiming for a Slim Tuesday. 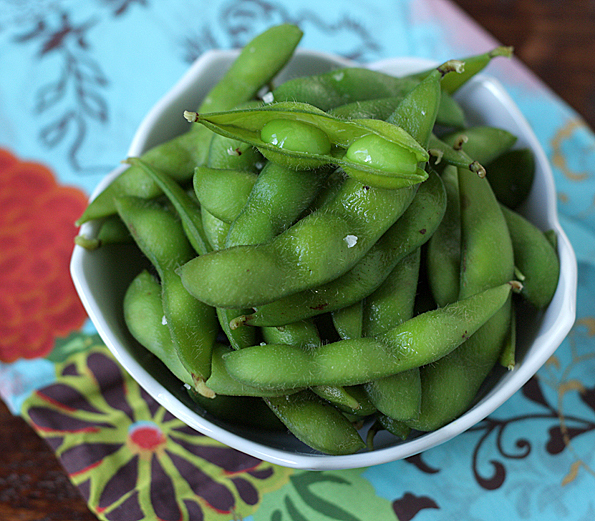 In honor of the Mardi Gras colors (purple, green, and gold), I thought I share with you a “recipe” for one of the Fuji family’s favorite healthy green treats—edamame (soybeans that are harvested while still green and sold still in their pods). I say “recipe” because it’s really not a recipe, but a method for preparing the bright green pods. Squirrel thinks edamame are candy (which I’m not about to correct her on), and has a blast squeezing the beans out of their pods and into her mouth. Inevitably several of the soybeans come flying out of their pods in unexpected directions and shoot into the air, which always causes a fit of giggles. So not only are they delicious, but they provide good entertainment too. 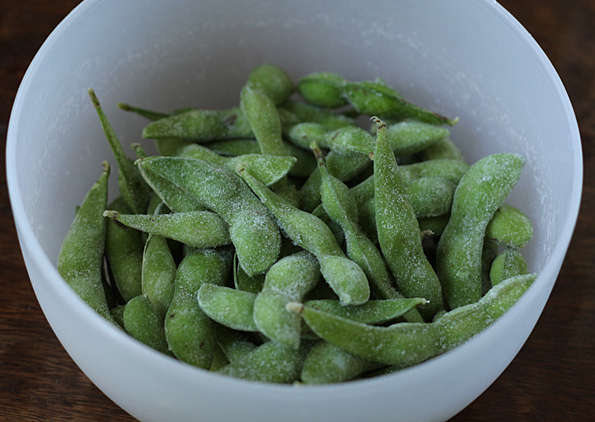 Edamame can be found in many grocery stores in the vegetable section of the frozen food aisle. They are sold two ways: in their pods or shelled. For purposes of eating them plain, I always buy them in their pods because they’re more fun to eat that way, and the pods help to trap moisture and defrost the beans more evenly. Ok, so my “recipe” couldn’t be easier. I call this method the “Lazy Mama Method.” All I do is grab a handful of frozen pods (as much as I think we’re going to eat) and throw them into a heatproof bowl. and then forget about them for about 8 to 10 minutes. Then I drain the water and toss them with some coarse salt (either kosher salt or sea salt) and serve them! Complicated right? Yeah, I know, you must be completely overwhelmed right now. I’ll give you a moment to process all of that. Not only does edamame make a delicious snack (they are slightly sweet and nutty and very addictive), but they are so good for you! They are a good source of fiber, calcium, and isoflavones (can lower the risk of heart disease, lower blood cholesterol levels, and maintain bone density according to some studies) and are low in calories and high in protein, making them nice and filling. Makes as much or as little as you want! 1. 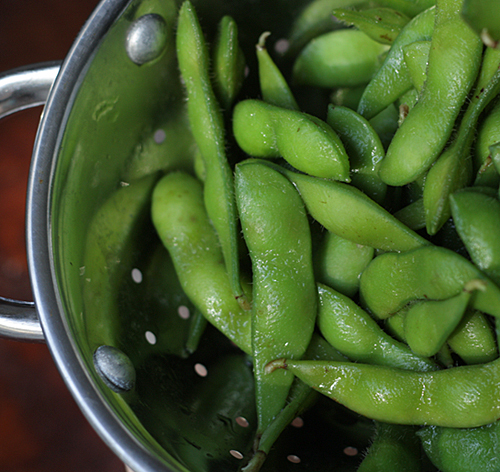 Place the amount of edamame you want to eat in a heatproof bowl. Pour boiling water over them (enough so that the pods are completely submerged). Let them stand for about 8 to 10 minutes. 2. 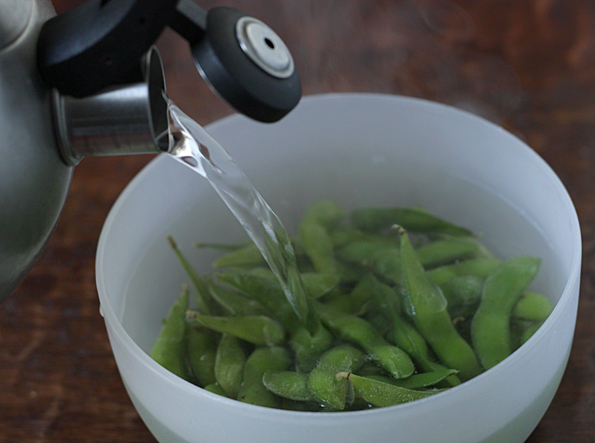 Stir the edamame and then drain the water. Sprinkle the bean pods with the coarse salt. 3. To eat the edamame, hold the edamame pod between your thumb and forefinger. Pinch down slightly to push out the beans, aiming for your mouth. Discard the pods. You are 100% correct, this is one of the best & healthiest snacks around. A nice simple whole food is a good thing! This is one of our favorite snacks too. We usually buy the ones in the microwave packages but your technique looks soooo much more appealing! 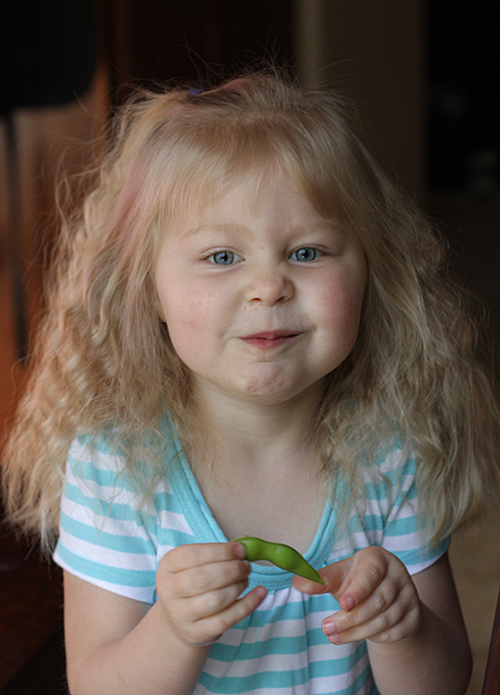 We love edamame at our house too. I usually just zap them. I’ll have to try your method. I’ll have to try that method! 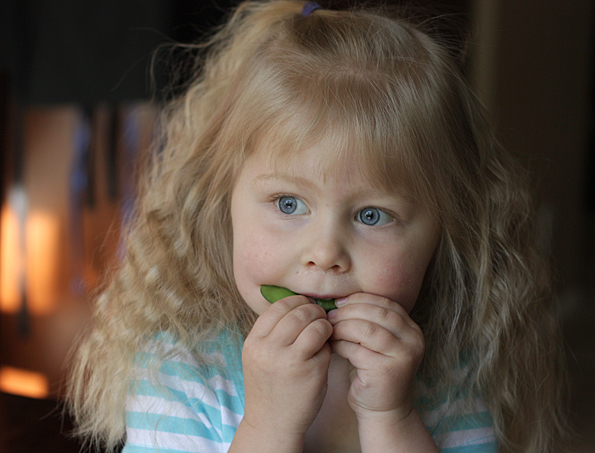 We love edamame at our house. 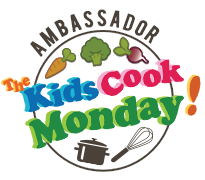 My kids gobble them down like they’re candy! Squirrel is looking so much older with her crimped hair! Squirrel is beautiful :) And I love the green of the edamame. I snack on edamame so much, half the time I feel a bit like a nibbling rodent! I love em fresh straight from the pod or roasted with miso or the dry kuromame you can find in Asian grocer snack aisles. So good! Love this post. @Dawn W— Thanks Dawn! I find that I save money this way. At least in our grocery stores, the microwave packs tend to be more expensive! @diva— You speak my language! YUM! Edamame!! I love them. Thank you for mentioning them. I had forgotten about them but now I think replacing Ritz crackers and brie in the evenings with edamame would be a very wise decision. PS: Could Squirrel possibly be any cuter?? LFM, what do you call these beans in English? great idea!!! and she is a cutie pie!!! This is my favorite snack to have everyday! I hadn’t had edamame until just recently. A restaurant near our old apartment sold it by the pint. Good times. I’ll have to try this method, I like easy! My boys think they are candy too! Love this idea, instead we all got belly aches eating the King Cake! I’ve been thinking that Squirrel should be the Nutella spokesgirl, but now I’m thinking she has a future with edamame. Maybe you could do something with Nutella-dipped edamame, kind of like Reese’s Peanute Butter Cups? Had so much fun at last night’s chocolate #GNO! You’re site is awsome, too! I’ll look up the name of the man who put on the chocolate-tasting fundraisor for us and pass it on. It was a nice event; power point, white tablecloths, champaign, chocolate-covered fruit and tiny potent chocolate squares! This is one of my favorite snacks! I like it with lots of salt! 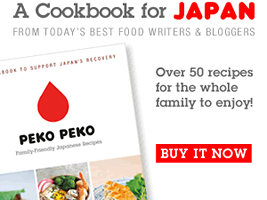 Perfect with a sushi meal, too! Now I’m hungry! For a little kick, I sometimes sprinkle some Shichimi Togarashi on them too. jag aldrig smaka !! kanske jag måste prova men din barn är så söt!! I made these last night. I took them to work and munched on them all day! So yummy. My husband thought I was insane but they are a delicious snack! And yes, if you’re not careful the beans will shoot out of the pods. I can see why Squirrel finds them entertaining! Ok… first off ur lil one is just tooo dang cute! Second… these look so good and a perfect snack. I love edamame and like to add it to stir fry and other dishes, but I’ve never just eaten it plain. It sounds wonderful, though! I know you mentioned shelled edamame, too, which I am on a mission to find, but haven’t been able to locate yet. 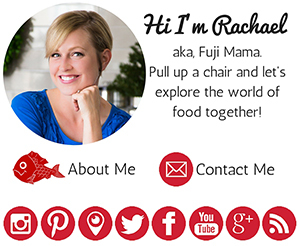 Rachael, this is a great post! 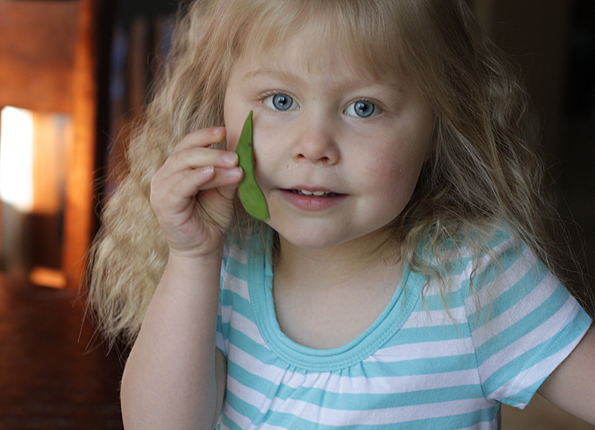 Your daughter is more munchable than those edamame though… And I love edamame! I always blanch mine for 5 minutes… but I like your “lazy mama” method. I’ll definitely give it a try! I am loving all your edamame posts! Your daughter is adorable. I enjoy the beauty of this post and how something so simple as Edamame can be such a great part of our meals! Whatever it takes, I will find these edamame. They’re quite hard to find here. I didn’t even know what edamame was, until I looked it up on the Web. Ha, soybeans ! I found you, and your recipe. Sounds great, and easy. I am on http://www.myfitnesspal.com it’s a great website, full of nice people, sharing healthy, fit foods. OMG Squirrel, should be in Commercial’s. She’s Darling, Precious, Adorable !!!! Thanks ! Mari in Ca. 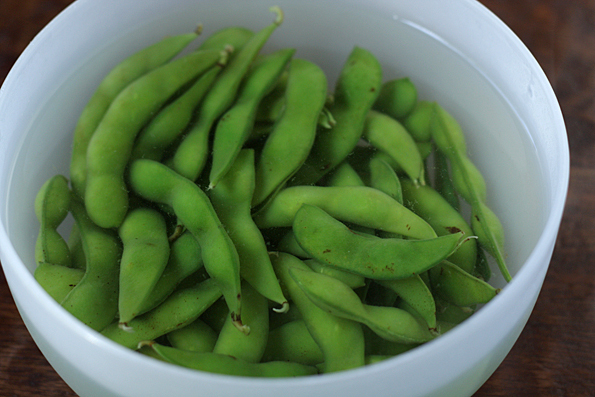 Edamame are really a good snack. My daughter really enjoys opening the pods and just nibbling the beans. besides they are healthier for kids. To heat up my edamame, I add a little cayenne pepper in with the sea salt. I love edamame!! I had never heard of them until we moved Japan. Now I think I have had them cooked every way possible, but this is the best way.